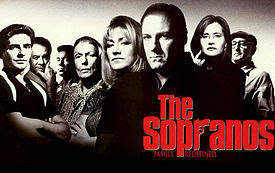 Were you a Soprano's fan? I was the longer version of "fan", called "fanatic." My whole family was crazy for the craziness, hating ourselves for liking the bad guys, sucked into the television for every episode. We even went as far as having "Soprano Nights". Each person (above 12-years-old) would have a night to be in charge of the meal we ate before the show came on. One night, my middle son (about 17 at the time) was not comfortable enough to cook something up so ordered 4 giant Pizza and set up his boom-box with Italian music playing throughout the meal. It was so fun and we sang along while eating. Every time someone on screen stopped into Vesuvios or Satriale's I got hungry. 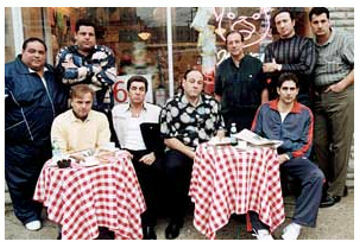 The hardest thing to watch without drooling was when Tony Soprano would just reach into the refrigerator and pull out a great Ziti Casserole that Carmela had whipped up earlier. It was always there. That's when I started having Ziti Casserole in our refrigerator for the taking - anytime - lunch, dinner or in-between. In the last season of the Sopranos, my husband was in New York writing on "30 Rock" over at the Silver Cup Studios and got to sit in Dr. Melfi's chair, and walk through the sets of the show and even saw Tony (Gandolfini) with blood all over his face during a shoot (shooting?). Even though my husband is not easily thrilled by celebrities, seeing a Soprano gave him a rush, too. We were definitely fans. For his birthday, I bought him a brick from Satriale's in New Jersey. Can you say, "obsession"? It has been years, but for some reason my husband and I were talking about that casserole the other day and it seemed like a great one to share on my blog. It's an adaptation of a Sara Moulton recipe from way-back, and it's worth the bit of prep to have a few days of this golden pepper and mushroom cheesiness at my beck and call. 1) In a large stock pot, cook the yellow peppers, onion and garlic in a drizzle of olive oil on low/med. heat, covered until soft. This should take about 20-30 minutes 2) Add the cream to the stock pot, stir together, add salt and pepper. Then puree with an immersion blender (or you can use a blender). Reserve this Yellow pepper sauce for later. 3) In a deep skillet with a drizzle of olive oil, cook the red and orange pepper slices with the mushrooms, salt and pepper on low/med until just cooked through (about 10 minutes). 4) Add the red pepper mixture to the yellow pepper puree, and include the cooked Ziti, the scallions and 1 cup of the cheese. Stir all together (use the reserved pasta water as needed.) 5) Pour this Ziti pasta and peppers, etc.. into a large casserole dish (or I made a pyrex 9x12 plus another 8x8.) Sprinkle with remaining cheese. Bake on 350F for about 20 minutes til heated all through and the cheese on top is golden. Serve or cool and hold in refrigerator. Sometimes the best things happen when you're not trying so hard. These Watermelon Cubes with Balsamic Glaze came about from playing with my food and left-over watermelon slices. They are just the right beginning to a meal (amuse bouche), a palate cleanser between courses or a unique addition to a dessert/cheese tray. A while back, I was serving a 6 course meal to a "dinner client" for a fund raiser. They had chosen several hardy courses that included a creamy corn soup, scallops with chips, and braised short ribs with potatoes. I knew they really needed something fresh, light and bright in the middle of all that to re-set the taste buds and moisturize the bite. These Watermelon Balsamic Cubes were just the right size, continued the somewhat elegance of the night and yet gave it a casual, down-home tasty treat. Since that night, I've served these to kids on picnics and lined up on trays for July 4th picnic shooters. Their simplicity gives them style, yet they are definitely perfect for a Simple Saturday. Mint or Basil leaves for garnish. 1) After trimming and cutting watermelon into 1x1 inch cubes, use a small melon baller to carve out the center of each cube. Make sure to leave the sides and bottoms in tact to hold the syrup inside. 2) Turn the cubes over on a paper towel to drain for at least 20 minutes. At this point you can also wrap lightly with plastic wrap and hold in the refrigerator til needed for several hours. 3) When ready to serve, add just a few drops of Balsamic Reduction Syrup or Balsamic Creme to the center and place each cube on top of a mint or basil leaf. Is there any treat more classic than a chocolate chip cookie? There are thousands of variations and I've made and eaten about half of those, but I'm swearing by these being my favorites. I think I was in college when I discovered how easy it was to freeze home-made cookie dough. One hour making a batch of cookies, then freezing them meant I could have home-made chocolate chip cookies at my beck and call (my freshman 10 was 20.) I've been zip-locking those goodies ever since. When I visit my mom, I make a few bags for her and my brother and his wife to tide them over til my next visit. When my kids have friends over they grab and gobble amazed that I "whipped up home-made cookies" so fast. And when the mood strikes me (which is more often than needed), I can take out just one or two and bake them in my toaster oven for a single treat. For the money and time spent, I don't think you'll find a "roll" of bake-off cookie dough any easier. This recipe came about like many others; I was hungry. It happens a lot that way. I was sitting on the pier watching the Pacific Ocean and the wind was turning chilly and I still had a 2 mile walk ahead of me to get home. I was thinking how a nice hot bowl of oatmeal feels on chilly spring mornings. Then my mind turned that bowl of oatmeal (way too quickly) into a cookie. If I'm going to have a cookie it would have to have chocolate too, and if I really went crazy I'd add pecans and dried fruit...nah, not just dried fruit - big dark cherries. In fact, I'd leave out the nuts so they wouldn't upstage the cherries and chips. I love cherries and cherries with chocolate. When I was little, my mom would bring home boxes of Chocolate-Covered Cherries. I'd bite each candy with excitement, as if the cherry was a surprise to me every time. 1) In a large bowl, combine the flour, oatmeal, baking powder, baking soda, salt and cinnamon. Stir together, then add the chocolate chips and cherries and toss to combine. 2) In another bowl, beat the butter, sugars and vanilla together. Then add the egg and beat again until creamy. 3) Add the creamy ingredients to the dry ingredients and stir well with a wooden spoon. 4) Scoop out cookie dough in about Tbls. size balls and place on a parchment lined baking sheet. **You can freeze the dough at this point (bag, label and return to the freezer for cooking later), or Bake for 10-12 minutes at 350F. The secret is- DON'T OVER-BAKE. Take them out even if they don't look done and give them a chance to cool= chewy, chocolate and soft. Remove, allow to cool and try to discipline yourself to not eat the whole pan in one sitting. Laissez les bons temps rouler (Cajun French for "Let the good times roll".) I like the attitude. Lately, maybe it's the changing of seasons or just watching a few people in my life go through some real life struggles, I really need that inspiration. (Read as a loud and long Cajun yell) Wwoooo-Hooooo! Doesn't that feel good? Sometimes if I let myself exhale really loudly, like a Hollywood Yoga class, it really releases stress. If you're a cook, you'll completely understand this: Working in the kitchen on a multi-layered stew with chopping and mixing and several steps to it can be relaxing. It's therapeutic to me. If you don't enjoy cooking, you've probably stopped reading just thinking about that insane remark. Gumbo is one of those stews (if done somewhere near authentically) that has several layers of prep and cooking. It was this month's Daring Cook's challenge and the biggest challenge about it was finding the time to enjoy the process. Looking back at it, I feel like I exhaled really loudly. The best part was I also got to have an amazing dinner that my whole family absolutely loved. Go for it, laissez les bons temps rouler! Roux (roo) - This forms the foundation for good flavor. It's made by heating fat (rendered chicken/duck fat or canola oil), then adding an equal amount of flour to the heated oil. Whisk on med. heat (about 15 minutes) to turn the roux into a dark caramel color full of flavor and natural thickening power. After it's a nice dark color, you add the onions (and change to a wooden spoon for stirring) and let them caramelize and darken the roux further. Holy Trinity (not that one) - This is a mixture of chopped onions, celery, and green peppers. In Cajun cooking and a lot of mid-southern cooking, this combo forms a base of flavor for many stews, braises and soups. The preparation of classic Cajun/Creole dishes such étouffée, gumbo, and jambalaya all start from the base of this holy trinity. In other cooking a similar mixture is used of chopped onions, celery and carrots and is called Mirepoix (meer pwah) from french cooking and Soffrito (so-Free-toe) in Italian. Okra - These delicately ridged and tapered green pods, sometimes called Ladies’ fingers, are a member of the mallow family and are bursting with tiny seeds as well as the glutinous compounds that make okra such a natural thickener for soups and gumbos. The smaller okra is more tender and sweet. I grew up with boiled okra (an acquired taste, I think) and fried okra (how can that not be great, right?) Filé powder (fee-lay) - In the 1800s, Choctaw Indians traveled in from communities on Lake Pontchartrain to sell this powder at the New Orleans French Market, along with bay leaves and handmade baskets. The Choctaws make filé by drying, then finely pounding, the leaves of the sassafras tree into a powder, then passing it through a hair sieve. The leaves, in the form of filéfilé was used to thicken the stew when okra was not available, but John Besh likes to use both. He cooks the okra in the gumbo and adds a couple dashes of filé, too, at the end. He also likes to pass filé at the table as a seasoning. The word comes from the French word filer, meaning, “to spin thread,” which is a warning not to add filé while the gumbo is still boiling, as it has a tendency to turn stringy. 1. Prepare homemade chicken stock, if using. 2. Prepare homemade Basic Creole Spices, if using (recipe below). 5. In a large cast-iron or heavy-bottomed pan, heat the chicken fat, duck fat, or canola oil over high heat. Whisk the flour into the hot oil – it will start to sizzle. Reduce the heat to moderate, and continue whisking until the roux becomes deep brown in color, about 15 minutes.